Join us for a spooky night of outdoor yoga at the former prison on October 26th. The Boo-Asana Halloween yoga class is a glow-in-the-dark yoga experience held on the Liberty Green. 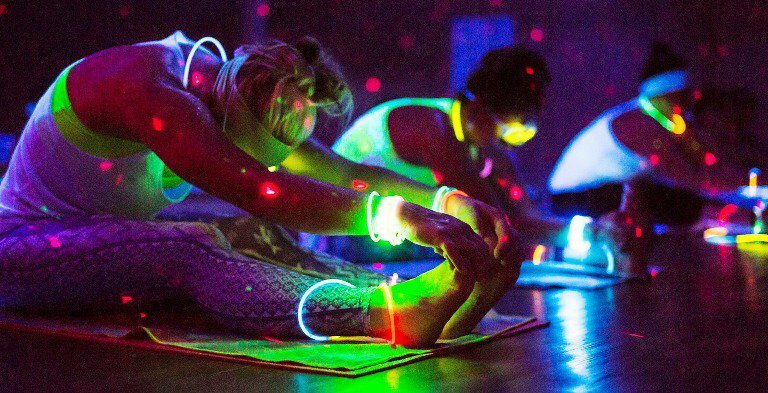 The all-level “glow and flow” Halloween themed class begins at 7:00pm, and the $20 fee includes the yoga class and plenty of glow in the dark goodies. Meet at the Liberty Green, the former baseball field, and BYO yoga mat. Claim your ticket on Eventbrite here. On the day of class, meet us at the Liberty Green, the former baseball field, located on Central Green Street. Please arrive 10 minutes before class starts, as the event will start promptly at the scheduled time. Beth hosts a variety of unique yoga experiences, including yoga at the National Building Museum, Goat Yoga, Silent Disco Yoga, Glow and Flow, Art & Yoga, and Kitten/Puppy Yoga at the Animal Welfare League of Arlington. She is a Yoga Alliance Experienced Registered Yoga Teacher and Continuing Education Provider. Her classes incorporate mindfulness, breath work, and thoughtful yoga sequences. Beth takes special care to meet each student at their own level, in order to help them meet their personal goals. For more information about Liberty, stay in touch with us on Twitter @LibertyLorton. To see highlights from all of these events and more, find us on Facebook at Liberty Lorton and on Instagram @LibertyLorton.